The X-Series Mobiles introduce our new fully customizable Multi-Color LCD display screen. You can adjust the complete display to be exactly as you want it. Beyond the display, you can fully customize your channels to display their alpha-numeric names or frequency settings. The X-Series Mobiles also introduces our new dual sync mode! With this option, you can single or dual sync two different channels and display both their frequency and name simultaneously. If you prefer instead to monitor up to four channels; you can single line display a channel's name or frequency. Scanning channels and frequencies has now gotten even easier! A new menu allows you to select scanning resume methods. You can set the radio to start scanning immediately during reboot, resume scanning if you interrupt scanning to transmit, or start scanning soon as it powers on. The UV-25X4 will save your scanning preferences even with a power interruption. Frequency scanning has gotten a full overhaul; you can edit and scan through frequencies exactly as you prefer. Set your frequency range and frequency interval (step) right through the UV-25X4 on-screen interface. 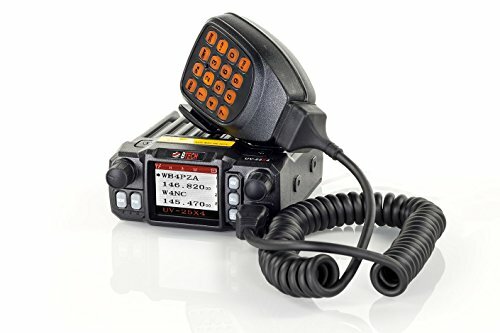 Dual Watch monitoring VHF/UHF and 220Mhz: The 220 MHz band antenna lowpass filter is switched with a relay and the 2 meter lowpass filter and 70 cm highpass filters are switched with PIN diodes - resulting in a audible relay switch noise when monitoring 220MHz with VHF/UHF simultaneously. A relay that completely isolated the 220 MHz RF filter won't impact the RF performance of the 2 meter/70 cm bands. If monitoring multiple 220MHz or VHF/UHF simultaneously the relay is not heard or used.